EDIT: The map has been released as promised by the Court, along with a brief opinion on February 19, re-outlining the views of the Court. We have included it here for ease of reference. Ever since the Pennsylvania Supreme Court issued an expedited order in League of Women Voters v. Commonwealth, ordering the Commonwealth Court to proceed with discovery and findings of fact, many have speculated as to whether the Court would really rush out in front of the Supreme Court of the United States on the issue of gerrymandering and issue a decision attempting to proscribe the practice. In January, the Court not only did so, but in a 5-2 decision, required the legislature and governor to come to terms on a new congressional map before this year’s primary elections. 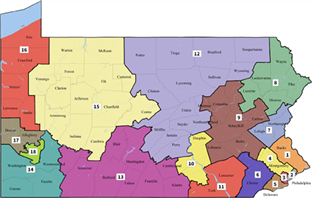 The Court also ruled that Pennsylvania’s current congressional map violates the “Free and Equal Elections” clause in Article I, section 5 of the Pennsylvania Constitution. Gerrymandering has a long and defiant history in the political systems of the United States—indeed, the practice is named after one of our founding fathers, who himself was hardly its first practitioner. Scholars, politicians and courts have proposed a number of solutions, but to date, none has proven to be particularly successful in curtailing the practice. Some argue that gerrymandering is the inescapable result of the political system, and that the power to draw lines is the natural spoil of the sport. In her 5-2 majority opinion, Justice Todd holds that Article I, section 5’s “free and equal elections” clause requires that the districts drawn by the legislature be 1) compact, 2) contiguous, and 3) maintain the integrity of political subdivisions. “Our founding document is the ancestor, not the offspring, of the federal Constitution,” the Court explains, which is significant in part because the traditional grounds for federal suits against state gerrymandering are grounded in the 14th Amendment—written long after the Pennsylvania Constitution’s Article I. The Court delves into some of the most notable scholarship on the Pennsylvania Constitution’s development, finding that the “free and equal” provision was a response to the restrictions on the right of political minorities to vote, and that an election is not free and equal if individuals’ votes are targeted for dilution for political purposes. Such targeting robs the voter of his voice, and is antithetical to the democratic process. The Court includes a great deal of discussion on the scientific and mathematical model findings of several expert witnesses, which support the Court’s ultimate ruling that this plan fails to satisfy the three overarching goals of the free and equal elections clause. Finally, the Court gives a defense of its decision to rewrite the congressional map if the democrat Governor finds the Republican legislature’s plan unacceptable (which happened yesterday). The Court cites proudly to a Scalia decision from SCOTUS in Growe v. Emison, 507 U.S. 25 (1993), which ruled that federal courts should exercise Pullman abstention where a state court was redistricting the legislative map in an attempt to comply with federal law. (Scalia also called this a “highly political task” in that same opinion—the Court spends relatively little time in this opinion on justiciability or political question doctrine, which have traditionally prevented these suits). SCOPA also argues that its powers derive from the legislative codification of SCOPA’s King’s Bench authority (SCOPA may “enter a final order or otherwise cause right and justice to be done.” 42 Pa.C.S. § 726). Of course, whether this King’s Bench authority allows the Court to usurp a traditional legislative function is a somewhat different question, which the Court does not address. Chief Justice Saylor dissents, arguing that the Court should have awaited the “anticipated guidance from the Supreme Court of the United States,” particularly in light of how long the challengers waited to challenge the 2011 congressional map. The Chief Justice views the matter as inherently political, and would leave greater deference to the political branches. Saylor also argues there is no “right to an equally effective power of voters in elections,” and that a voter’s diluted vote is part of the democratic process. Citing to a SCOTUS concurrence by Justice O’Connor, Saylor suggests that the “prophylactic” rule created here could have a chilling effect on even legitimate considerations (such as giving racial minorities greater pull in elections). Saylor also notes that the power to draw districts is left by the Federal Constitution’s Article I, section 4, to the legislatures of the states. Justice Mundy dissents, arguing that the state constitution provides no clear guidance on how congressional maps are to be created, and criticizing the Court for “these vague judicially-created ‘neutral criteria,’” which “are now the guideposts against which all future congressional redistricting maps will be evaluated, with this Court as the final arbiter of what constitutes too partisan an influence.” Mundy also points to Erfer v. Com, 568 Pa. 128 (2002), in which the Court had previously considered and declined arguments to rule that gerrymandering violated the state constitution. Justice Mundy also discusses the SCOTUS caselaw cited by the majority, discussing how none of these cases dealt with the elections clause of the Federal Constitution’s Article I, section 4. Conclusion: The political dispute becomes legal; but will the legal become political? To say there are differing opinions on the validity of the Court’s judgment here is an understatement. The longshot appeal to SCOTUS—denied on February 5—argued that SCOPA had usurped the role delegated to the legislature by the Federal Constitution in Article I, section 4. The argument is that the Federal Constitution gives to certain branches of the state government specific jobs to do which may not be reviewed or impinged by other branches of the state government in order to ensure that certain necessary tasks within our federal system are left outside of state politics. If you recall, this was the argument embraced by a concurrence in Bush v. Gore in overruling a state court’s interpretation of its own laws, and instead accepting the state legislature’s prescribed process for vote counting. This argument may yet come back, depending on how SCOPA draws the congressional map. But the biggest gripe which opponents of the decision have is that the Court has entered the political fray and rendered political disagreements justiciable. There will be hew and cry when a democratic map is upheld, or vice versa, and there will never be peace. The Court’s bold move may usher in calls for reining in the Court’s power, or even for a constitutional convention. When the political becomes legal, there is a danger that the legal will become political, subject to whims and passions. Law is a science, or so we lawyers like to think, separate and apart from the politicians’ arts. Now SCOTUS will have its turn; will its ruling be as bold? Or will SCOTUS dodge again on justiciability grounds? With League of Women Voters, the Pennsylvania Supreme Court takes a bold step into the fray. History will judge whether the step was wise or ill-considered. The Supreme Court of Pennsylvania rules that filing late for a special election cannot be excused. The Green Party filed its Certificate of Nomination on January 31, 2017, one day late for the March 2017 special election in Philadelphia County (home to more than a few election disputes). The deadline for the submission of its nomination form is in the statute, which states that the deadline is 50 days prior to election day. In addition to this statutory notice, the Green Party was informed by mail and email of the deadline, but still missed it. The Green Party’s excuses are less than stellar. The official responsible for submitting the nomination certificate wasn’t in the habit of checking the party email (that was someone else’s job), and she only checked the PO Box once a week (and missed the mailing). She called the day of the deadline and spoke to someone on the phone about their campaign finance report, and asked a general, “Anything else we should be doing” question, which naturally was misunderstood by the campaign finance person on the phone. The Green Party went to the courts for relief, starting in the Commonwealth Court (election disputes being one of the few matters over which the Commonwealth Court enjoys original jurisdiction), and requesting a writ of mandamus against the Department of State. The Commonwealth Court denied the relief, and the Green Party appealed to the Supreme Court of Pennsylvania. Justice Mundy, speaking for the 5-2 majority, holds that there’s nothing the courts can do here. For one thing, the General Assembly, though bound itself by certain restrictions on what it can legislate regarding elections, is given plenty of room to set the rules by which elections are done. Absent a clear abuse of discretion, or an unreasonable interpretation by an executive official, the acts of the General Assembly should generally be left undisturbed. Appellants failed to consult the relevant statutes, did not check the Department’s website, did not read the e-mail and attachments sent to the Green Party, and did not check the Green Party’s post office box in a timely manner. Furthermore, rather than seeking critical information about the filing of a nomination certificate from someone in the elections division, [Green Party officials] chose to consult with someone in the campaign finance division. Because the Green Party failed to demonstrate a clear right to relief, their application for writ of mandamus was denied. A few other notes on the majority opinion: the Green Party argued it had First Amendment rights that had been trampled by the Department of State declining to put them on the ballot. This argument was rejected. Furthermore, the Green Party advanced some sort of explanation where the deadline was actually January 31, and that they filed on time. This lead us to the concurring and dissenting opinions. The majority counts the day of the election as day one, but excludes the final day landed on (as the statute’s “day-counting” rules seems to require). Justice Todd insists that the day before the election is day one, as the statute itself seems to require. No matter, both calculations end up at the same result. (I know this sounds impossible, and while I went into law to avoid math, I have double-checked and they do both end up at the same result). Regardless, Justice Todd agrees with where the counting ends up, and the Green Party was late. But Justice Donohue begs to differ, and argues that the day of the election should be day 1, and that the final day must be included for the final count, which leads to a deadline of January 31, and makes the Green Party’s application timely. She calls this a “common sense” reading of the statute, although Justice Todd retorts that there’s nothing common sense about calling the day of the election the first day prior to the day of the election. Justice Donohue argues that, where there is ambiguity, the tie should go to the democratic process, allowing parties and citizens to more fully participate in the process. The basic conclusion of this case is that you should file on time if you’re a political party seeking to nominate a candidate for an upcoming election. The Green Party’s arguments feel undeveloped, or at least, the Court never got a grasp of what they were arguing if they did make developed arguments. It’s obviously a tough situation to see a candidate who was properly nominated by a political party denied the chance to be on the ballot, but deadlines are deadlines. The Supreme Court’s ruling in this case comports with its overall views expressed in Sprague v. Cortes, where the Court held that the legislature and executive should be allowed to handle elections as they see fit without the intervention of courts. In Pennsylvania, the policy of the courts is one of non-interventionism when it comes to election.